2002 Update - This poem has been donated to the Domestic Violence Network of Greater (DVNGI) Indianapolis for a fundraising project to raise awareness to domestic violence. 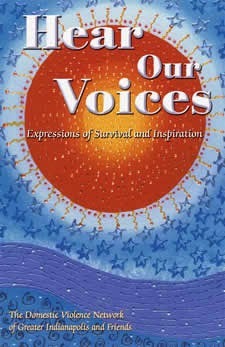 The book was published under the name "Hear Our Voices" and is now available at Border's Book Store or from DVNGI. Proceeds from this project go toward furthering education about domestic violence and victim assistance. The project was funded by a grant and all proceeds go directly to assisting victims. 2003 - This poem was used in the "Shattering The Silence" project presented by Channel 13 News. The project was a continuing campaign raising awareness of Domestic Violence. I was honored to have been part of this project. Every nine seconds in the United States a women is beaten. Domestic Violence is the most under-reported crime in the country. Eighty percent of the children who live in homes where domestic violence occurs witness the abuse. On average four women are murdered every day by their male partner in the U. S. Women in the United States are in nine times more danger in their homes than on the street. What will You do to help End Domestic Violence? Wondering who would ever love me.